Leading Manufacturer of 16 Port Fast Ethernet Unmanaged Switch with External Power, 8 Port Fast Ethernet Unmanaged PoE Switch with 4 PoE, Unmanaged Switches, 24 Port 10/100/1000Mbps Gigabit Ethernet Un-managed Switch and Switching Solutions from Mumbai. DIGISOL DG-FS1016D-A is a 10/100 Mbps Ethernet Desktop unmanaged switch designed to enhance network performance in a compact form factor. The switch comes with 16 x 10/100 Mbps ports, offering solutions for accelerating bandwidth needs of small Ethernet workgroups. The switch uses store and forward packet-switching technology which offers reliable data transfer. This switch is ideal for network connectivity for the SOHO environment. DIGISOL DG-FS1008PH-A is a Fast Ethernet PoE unmanaged switch designed to enhance network performance in a compact form factor. The switch offers 8 10/100Mbps Ethernet ports of which 4 ports are Power over Ethernet (PoE) complaint to IEEE 802.3af. The PoE ports can be used to power up devices complying with 802.3af using the existing Ethernet cable. The switch uses store and forward packet switching technology which ensures reliable data transfer. The switch also supports automatic MDI/MDI-X detection which eliminates the need of a cross over cables or dedicated uplink ports. Thus the DG-FS1008PH-A is an ideal solution for small Ethernet workgroups and application requiring PoE. 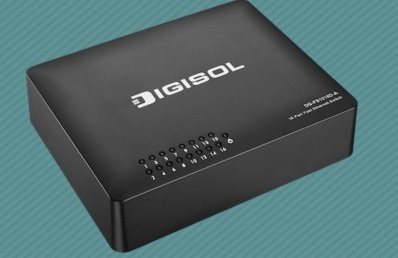 DIGISOL DG-PE2248D Power over Ethernet Injector allows to connect IEEE 802.3af compliant network devices to a non-PoE LAN switch port. The injector can be used to connect a wireless access point, IP phone, network camera or any IEEE 802.3af compliant powered device (PD) to a switch. DG-PE2248D effectively provides Ethernet data and DC power to a PoE compliant device (IEEE802.3af compliant) using a single Ethernet cable. DG-PE2248D provides an efficient and convenient solution for remote network devices (PoE Compliant) where available space is limited and/or no power source is readily available. • Compatible with IEEE802.3af compliant devices.